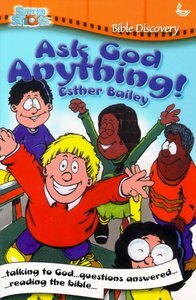 Snapshots Bible Discovery: Ask God Anything! B club 6 is the (fictional) Bible group for year six in a local school. The kids in the group all struggle with different things* Why is the Bible so difficult to read? ; How can you know God hears your prayers? ; Do animals go to heaven? About "Snapshots Bible Discovery: Ask God Anything!"